A package from HARIBO is always a welcome arrival in this house and we were keen to see what HARIBO would bring to the Easter build up. Bringing some extra ‘eggcitement’ to the Easter countdown, 20 hand-crafted ‘Double Yolker’ sweets have been randomly nestled amongst Starmix’s much-loved Egg, Bottle, Heart, Ring and Bear shaped pieces. 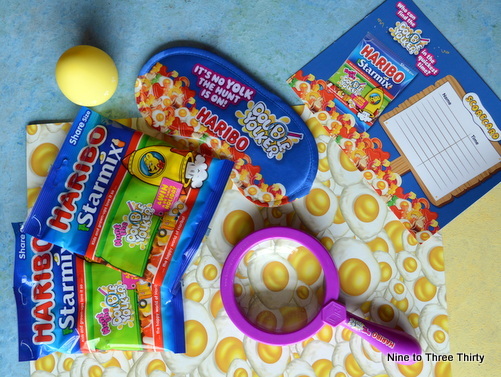 So it’s time to dive in and take up HARIBO’s invitation to ‘Hunt the Double Yolker’ in their limited edition packs of Starmix. Double yolks have long been considered good luck for those finding them in hen’s eggs. For those lucky enough to find a HARIBO ‘Double Yolker’ egg there’s a real bonus waiting for them. They will be treated to a UK family break at Forest Holidays (I’ve been stayed at a Forest Holidays site in the past and would love to have a repeat visit) – now that’s enough to put a spring in anyone’s step! On your marks, get set…HUNT! The HARIBO ‘Hunt the Double Yolker’ campaign will run until 21st April 2019, so hurry out and get a limited edition park of Starmix. Winners will have until 31st May 2019 to claim their prize, so don’t hang around. Terms and conditions apply. Not only that, but I have a box of HARIBO goodies to give away to one lucky reader. You’ll be able to look for some double yolkers yourself. Enter via the Gleam widget below. We love Haribo in this house. We would all love this. There’s nothing quite like Haribo! Double Yolker :- Great Competition, and prize. Haribo sweets, wonderful treat prize giveaway. Haribo, my kids love them. My grandson will ONLY eat Haribo. Must be something special in the taste !! wow, this looks like an amazing treat!! Mmm yummy, my favourite is the fried egg, what’s yours? Haribo are just the best, esp fried eggs and hearts! we love Haribo!! I love their adverts with the adults dubbed with young children’s voices!